Sweet slumber came once more although I suspect I drank a little too much of Sue's tea last night - the pee can is almost full. This morning the rain is light and intermittent which allows a view of our surroundings. Despite my reservations regarding the actual campsite we are in a truly alluring spot. We're deep in the valley surrounded on 3 sides by steep hills and next to a babbling river. Breakfast consists of hot tea and a just add hot water cup-o-porridge. It's not real food but it will see me through until such times as real food can be obtained. The surroundings of the campsite make a striking backdrop to our morning. Apparently, allegedly "Hagrid's Hut" is nearby. Being a fan of the Harry Potter films I know what Hagrid's Hut is. So 4 mature adults armed with mobile phones, intermittent internet access and not much intelligence set out to find a stone roundhouse with a pointy roof and a small garden filled with giant pumpkins and mythical creatures. Our search turns into a scene worthy of any Laurel and Hardy farce complete with head scratching and people falling over. After climbing a 40 degree hillside we're definitely where Google maps say the house is and yet there's nothing here save for a few boulders and a nice view. Comparing film stills against our view it appears we are in the right place. We later work out the magic of film is our demise. The small (I mean SMALL) patch of flat grass where we stand had a set built upon it for filming then was removed and the scenery was returned to it's natural state. While I do approve of the film industry not ruining Glencoe's natural beauty perhaps a small plaque would have been nice. Or...or perhaps not being wizards and witches but common muggles we did not utter the right incantations to see Hagrid's Hut. Dammit, what fools we are. Hagrid's Hut woz 'ere. Apparently. Allegedly. We are a day ahead of the main contingent of our group, who will arrive here this evening. 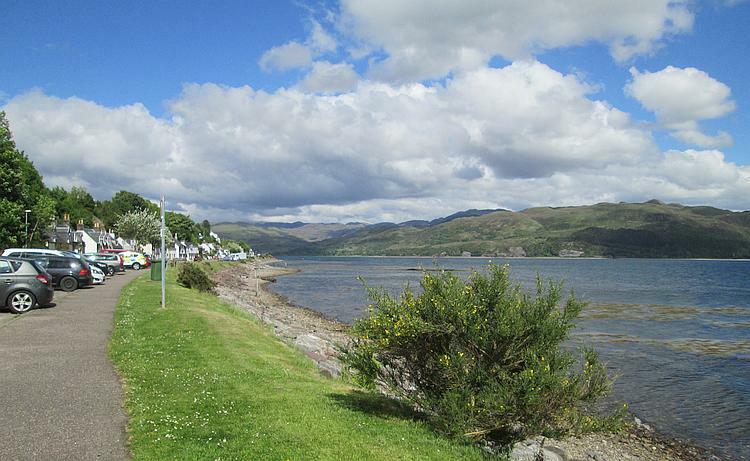 Sharon and I are heading for Applecross today, breaking up the long haul to Ullapool. Several of those who've also arrived early listen to our plan and decide to do the same. I discuss with Sharon riding with them, we decide for the most part we're happy at our own pace. We've ridden over 25,000 miles together these last 3 or 4 years and we've established a system that works for the most part. We're free to do as we please and there's no sulking or grumbling from the others, I'm sure they'll be happy in their little group too. The Morrisons at Fort William provides a proper and full brunch for a reasonable price. It also fills our fuel tanks at well below the rural price and fills my top box with food for this evening too. I know real adventurers should buy local produce direct from the farmer and source fuel from old ladies who sell it in pop bottles at the roadside but there's no denying the convenience and cost effectiveness of the common supermarket. 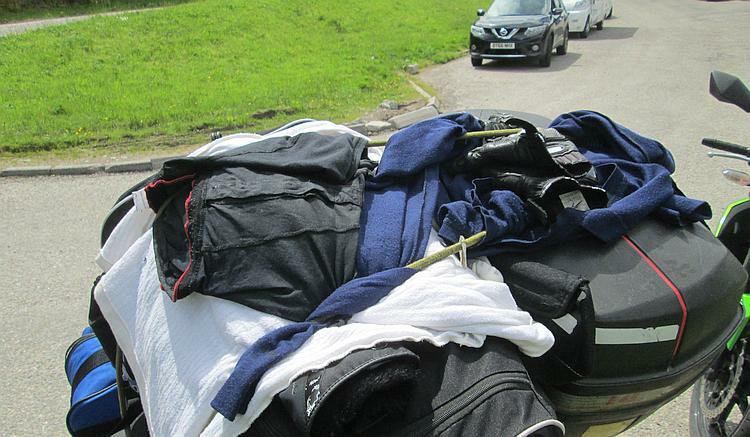 This is still the most effective way of drying clothes while travelling. Unless it's raining. Sitting in Morrisons brings back some memories. This time some 5 years ago we were in Scotland with Ian (Ullapool 2012). We had a blast on that trip riding these same roads with Ian and now he is trapped at home by his body that is failing him due to ataxia. I also remember Jim who once walked up Ben Nevis with Ian, both of them are older than myself and both of them were much fitter than myself. Jim died a short while back due to a brain tumour. Sharon and I look at each other. Life is short, this could be our last time. Let's make the most if hey sweetie. A rain shower passes over as we climb into the mountains along the A87 out of Invergarry. We're truly in The Highlands now. As a writer I ought to describe the scenery but it all starts to read the same - a string of superlatives. If at any point you want to know what we're seeing just say these words "magnificent, majestic, awe inspiring, marvellous, amazing, breath taking, wonderful..." and so on. Just look at the pictures or even better go and look for yourself. While being in the motorhome last night was a blessing today this motorhome in front of us and crawling up the hill in front of us is a curse. I can see Sharon chomping at the bit to get past but we have to wait patiently for a straight section of tarmac. Finally I gun the motor, Sharon follows suit and her 250 engine makes the motorhome disappear into the rear view mirrors. I'm quite shocked by her aggression but when I think on it she does have a mean streak that Madam Parker. Riding through The Highlands there are some rules. If someone comes up behind you, obviously faster than you, you let them pass when it's safe. We're riding the A87 towards The Kyle Of Lochalsh at just a smidgeon (ish) over the limit and yet we soon find a local tailing Sharon. I wait for the next straight, signal left and slow us both down enough to allow the driver to pass safely. He flashes his indicators in appreciation then vanishes into the horizon. As tourists we have to remember these roads are the main roads, the motorways for the local people. You can spot the uneducated tourists, they're the ones with a queue of frustrated cars following them. The speed difference between the sight seers and the locals makes these roads dangerous. Curving the bends and bending the curves along the side of Loch Duich is a pleasure I would travel many many miles to rejoice in. Well I would if this plonker in the Volvo would actually look in his mirrors and see that I would like to pass. If you wish to admire the scenery, find a safe place to park. The Eilean Donan Castle is bathed in sun and tourists by the time we pull into the car park. We stop for another expensive cup of tea before taking a much more peaceful road north, the A890 over the mountains and on to Lochcarron. Again just read the list of superlatives above for a description of what we're looking at. 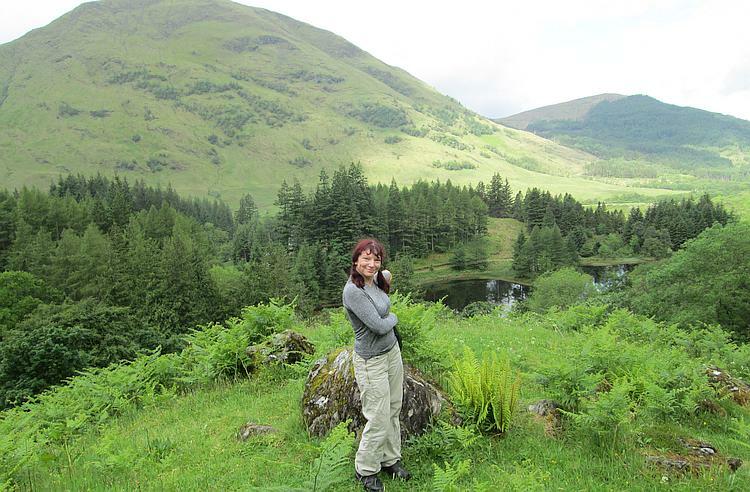 We stop in Lochcarron to admire the views, snack on a chocolate bar and I must admit life is wonderful. There's an elephant on the road ahead though and we need to discuss it. Bealach-Na-Ba. I can't think of a better place to make a big decision. Bealach-Na-Ba or "pass of the cattle" is the road over the mountains to Applecross. It has the fierce reputation for causing motorcyclists to drop their bikes due to it's steep climbs and switchback bends. I have ridden it once before and found it challenging but not impossible. Sharon's heard so many tales of disaster and broken motorcycles she is rightly concerned, perhaps even scared. Several of our group have already opted for the easy coastal route that only adds 20 miles on to the journey and I don't blame them. She knows she's a little short in the leg on the 250 and this makes putting a foot out to stabilise the bike that much more treacherous. She knows she doesn't want to spoil the whole trip by bending the bike or even worse herself. She knows the reputation of the road. She knows other much more experienced riders have "come a cropper" on the pass. She knows but on this warm, dry and even sun kissed day she is brave enough to say to me "OK, let's do this." So here we are, Bealach-Na-Ba. The single track starts out ordinarily enough save for the sign warning of doom for the inexperienced motorist and large vehicles. 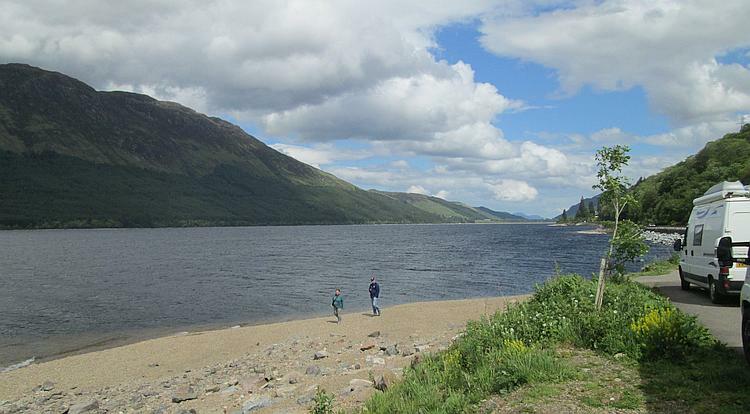 It climbs and climbs affording views across Loch Carron with the surrounding mountains and apart from a few twists and turns there's nothing but delightful views to report. Then we find ourselves riding along the edge of a deep cut in the hillside with barriers to our left. I feel the same as when the music in a film turns from light and gentle to tense and creepy. You know something bad is going to happen but you're not sure what. I can feel the tension building in my body and my mind. Drama in the form of geography and tarmac. Then you see it before you, the switchback cutting deep into the rock and turning 180 degrees sharp right. This places us on the outside of the turn and I use every inch of the radius to relieve the pressure. My heart skips - where's Sharon? Oh, she's around. The next one is to the left placing us on the inside. Screw that! I crane my neck to see if anything is coming down from above, seemingly not so I move to the right and use the far side of the road to lessen the angle and the shock, I hope Sharon's watching and does the same. I make my turn without meeting another vehicle and focus on the next one. We're on the outside once again but this one is steeper. I negotiate it safely with a dab of clutch and a hint of revs but now I'm scared for Sharon. Where is she where is she? I absolutely do not want to stop in this incline, blocking the road and risking dropping my bike, but I fear I may - where is she!? Oh god she's not there, she's dropped the bike and slid over the railing and down down down down into the ravine. Dammit she's got the toothpaste too. Ah...there she is, oh thank god for that, I don't think there's anywhere that sells toothpaste in Applecross. There are only 3 switchbacks, the rest may be angular or steep but safe enough if done with care. She's done it. She's only gone and blooming well done it! I park on the viewing point area and she stops by me. She's ashen with fear and equally glowing with pride and joy, I imagine I'd look the same if I were ever foolish enough to bungee jump or skydive. "Wooohoooo! Never again." That seems to be about right, she's done it and conquered her fear but she thinks luck was on her side and she has no desire to push it. Well done Madam Parker. Both motorcycles have survived. Phew! As we admire the views we're joined by another couple, both riding Kawasaki W800s with Germanic plates. They're probably a little younger than us and both smart, healthy and of course they both speak perfect English. Actually we learn she's originally American but she seems to have adopted a German lilt in her speech. They're lovely and we all share in the joy of having survived the pass as well as the landscape laid out all around us. As we talk of the weather Sharon advises them of the way we use regular waterproofs over our supposedly waterproof bike gear. This will crop up again soon. The far side of the pass is easy enough to ride. It would be hellish on a windy day but as the sun sinks in the sky a little it is enchanting to see the islands and inlets below us. If I recall those Island will be Raasay and Rona, perhaps that's Skye in the distance? 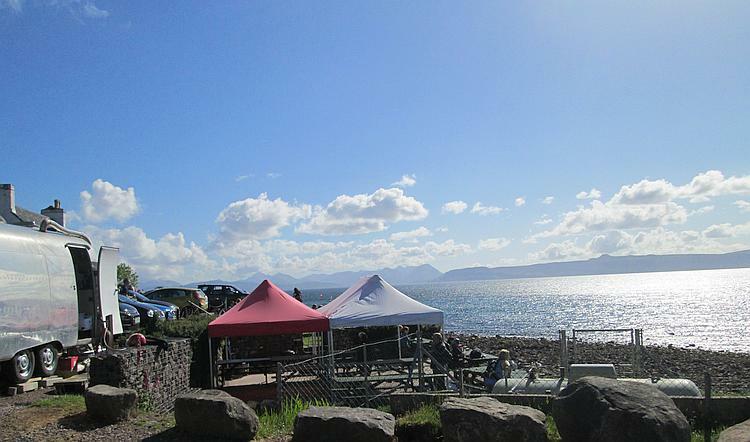 £18 for two this time at Applecross's campsite. I think what's changed is it used to be £10-£15 for a tent, now it seems to be £9-£10 per person. The campsite is great save for the well documented lack of facilities in terms of numbers. The Showers and toilets are fine, it's just that there's only 2 of each for the boys and 2 of each for the girls. On a quiet week day this is fine but on a busy weekend? It's middling tonight so the facilities are busy but acceptable. We cook our food, take a stroll along the shore road then join our friends in the pub for an evening of chat. The weather has been very much on our side today, the bikes are great, Sharon and I survived the notorious Bealach-Na-Ba pass and all is well. I hope we're making the most of it because all this shall pass too one day. The pub at Applecross offers something to look at with your drink. If you've got a great travelog then we'd love to publish it on here. Click Here. What a fantastic trip, I'm looking forwards to the next installment! It's far too long since I rode a motorcycle in Highlands, probably over thirty years if I do the sums :(. I was there a little more recently but still about 20 years ago, on the Commando. I well remember the road-hogging campervans too. I followed one for what must have been 20 miles easily - the driver just refused to let me past by using the passing places despite the signs telling him to do so. Eventually i managed to slalom past on the verge but it was much more tricky than I liked (and probably than I would do now). The most scenic part of the trip was round the B869 south of Kylesku. This road hugs the coast and was so beautiful I had to stop several times to drink it in. I don't know if it's on the official 500. C'mon guys! 20 years, 30 years? Even if you stick the bike on a trailer and use hotels there's no excuse for not riding the highlands. Fear not Ian, the NC500 route does take in Kylesku. I'll be getting to that soon enough. Now that I have a bike I am looking forward to riding all the Highland roads I have driven when I was younger to get to the various mountains and crags I used to walk and climb. Hopefully I will never cross Rannoch Moor in a blizzard on my bike, once in a car was enough. I still wonder at my own stupidity in my formative years and how I managed not to win a Darwin award before I was 30. Ah the Darwin awards! Like?most folks I believe it's a miracle anyone manages to reach 18 let alone 30. BMXs, fireworks, drunken antics, learning to drive.... you get the idea. Now at 1300 meteres in the Auvergne and still hot but bearable. The B869 is the Drumbeg loop. You'll see we covered this on the next day! It appears your life is so terribly awful Ian, having to enjoy all that nice weather in beautiful surroundings must be a real hardship. I admire your tenacity and dedication. Just for you Ren I shall force myself to enjoy the warmth and sunshine when I get home on Thursday. It's only 22°at night here at work, but then again this is midwinter in Brasil. While it is most pleasant (ie too hot) here in Blighty it will not last. You horrible reprobates need to understand we need the miserable rain to make sure we appreciate the rare sunny days. As my friend once told me "you need to get married mate, otherwise how will you know how happy you were?" You folk in the "north west" (it always amused me when I was a kid in County Durham when people called Manchester "The North") have to realise that for us midladers there's an extra 400 miles or so to get to the nie bits of the Highlands. And of course this involves the dreaded M6 or the trackless wastes of the Pennines. Many many boring miles before we reach any decent roads although there are some nice ones in the Borders but even that's 1 600 mile round trip. The alternative is to leave home at 6 pm or so, ride the 150 miles or so for the night ferry to Normandy and be rolling off onto almost immediately enticing roads in the early morning. Where of course the roads are empty, laced with delightful curves, the food is exquisite, the wine even better (evenings only of course), accommodation cheaper and better than the UK. And perhaps more important, motocyclists are treated as normal people not potential hooligans. The edit function can't come soon enough! If there were to be an edit function there would need to be a login function. If there were to be a login function there would need to be passwords. If there were to be passwords there would be legal responsibilities, the cost of a https certificate, the constant attention of hackers and and and... We're not in the business of being spelling fascists or grammar nazis so don't worry. As for The Highlands. From here to Fort William is 310 miles, from Birmingham it's 390 miles. Birmingham to Newhaven which will take you into Dieppe is 185 miles. Pool is 175 miles and will place you in Cherbourg. I take your point - but. The cost of the Newhaven ferry is £80 return which could pay for a Travelodge on the way up and another on the return leg. The Highland roads are less crowded than those I have experienced in Normandy. The roads are better in The Highlands. The scenery is considerably better in The Highlands. Accommodation prices are comparable. I...I will have to concede the food is MUCH better in France, I can't comment on the wine though. Did you not secure the awning properly? "Did you not secure the awning properly? " Went out for lunch under cloudless skies - on arrival at restaurant the heavens opened and a howling gale arose. On our return after about 90 minutes the awning which we've had for about 10 years was ripped and one support leg bent. Oh well, could have been worse. Being in deepest France can't argue with your mileage figures. However, the trip between the midlands and fort william is, in my experience, purgatory on a bike, and even with your mileages would be knocking on 800 miles of pointlessness for the return trip. My preferred channel port is Portsmouth to which there is a halfway decent 150 mile route from Brum following old Roman roads across the Cotswolds, which makes even a weekend worthwhile. WRT to food, yesterday had a stunning meal which I may even post some photos of...... ?9.50 for a plat du jour of sauteed pork strips in a lemon and honey marinade accompanied by tiny asparagus spears and caramelised vegetables. Then took a trip in a cable car up to 1800 metres. Excellent. Accommodation - the campsite we're on is ?11.10 per night and that's not the cheapest by any means. It has an amazing view of the Puy de Sancy on one side and the hills across towards the plateau on the other. It's also on the local equivalent of the Cat & Fiddle so is treated to a stream of motards all day long on Saturday. Thankfully a bit cooler today!